The word made me cringe. Everything about it — the connotations, inferences and even the snooty way it sounded as it rolled off my tongue — but–lerrr — made me want to spit it out. But that’s the way guest services were run here, and so over the next four days I carried a diminutive cell phone around just in case I needed any kind of assistance. The woman at the front desk told me my butler’s name was Aaron and that he would be the person at the other end of my calls ready to answer questions, and make any kind of dining, or trip arrangements for me. It was a strange concept, and one that I was not used to, but as soon as I met Aaron I realized this stay would be different from that of a typical hotel. The tickle in my throat was unrelenting and the bouts of coughing seemed to never end. 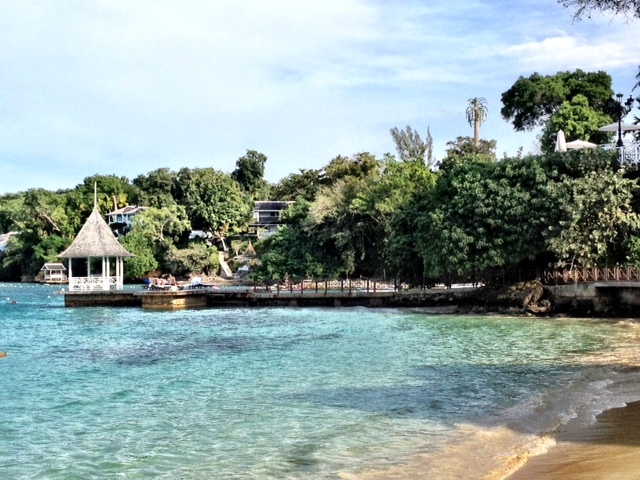 I was sick and had only four days in Ocho Rios. I figured if I could just get my nose to stop running I might be able to see the blue waters and verdant flora that flanked The Royal Plantation’s stretch of beach without the obstruction of a tissue. Regardless of how I felt, I still hoped to visit several places, all in close proximity to the hotel, so I reasoned that even if my pesky cold would not go away I would still stick to my plans of touring the art and pottery galleries, and Scotchies, a local jerk place that was said to do it better than anywhere else on the island. Aaron had kindly set up the short tour for me and my husband and offered to accompany us. We took him up on his offer, hoping that we could learn about the Jamaican culture through the eyes of a local. On the way to Harmony Hall art gallery, Aaron gave us a lesson in Patois, the local language spoken by Jamaicans. We shared music interests and he cleared up some misconceptions that many outsiders have about Jamaicans and their love of reggae. Although reggae is a large part of the music culture in Jamaica, dance hall, a genre with strong connections to Rastafari and classified by the fast rhythms of digital instrumentation, is most popular on the island today. Later, our conversation somehow transitioned to the topic of food (as most of my conversations usually do), so Aaron thought it appropriate to prep us for the ethereal meal we were scheduled to have at Scotchies midday. “The secret ingredient to Scotchies’ jerk is the sauce,” Aaron said, almost in a whisper. We had heard that this roadside stand was well worth the long lines that often form around lunch and dinner, but were unaware that Scotchies’ sauce, made from the yellow scotch bonnet pepper, is the reason people travel from all parts of the island to eat succulent chicken and pork at this famous family-run business. 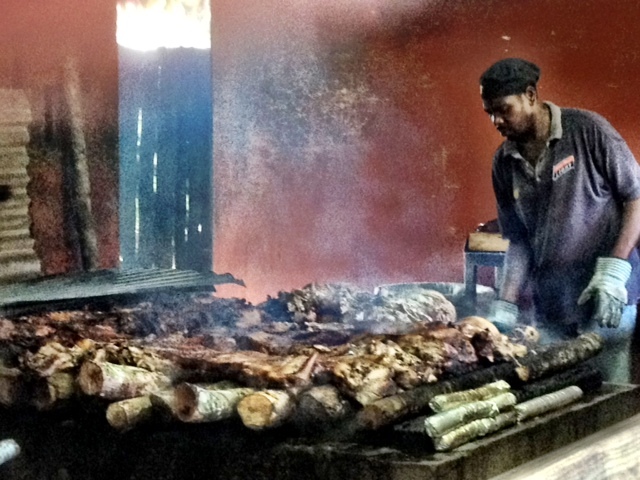 Scotchies also uses an old-fashioned cooking technique to prepare the meat; hot coals rest under long rows of sweet wood, supporting the meat, which is covered with wide sheets of zinc. The result is juicy cuts of chicken and pork layered with buttery, spicy, smoky-sweet flavors. 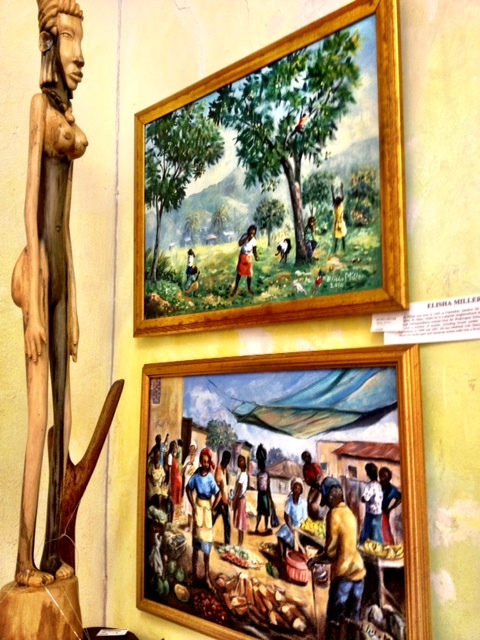 When we arrived at the gallery, Aaron showed us some of his favorite paintings from local Jamaican artists, pointing out pieces that depicted the arduous lifestyle of many, past and present, who have faced hardship in times of social and economic strife. In 1980, Annabella Proudlock acquired the intimate gallery with a group of friends and spent a year restoring the mid-19th century Methodist manse to its original state. More than 100 artists and artisans are represented, their works ranging from naive to highly sophisticated. On our way over to Wassi Art studios, Aaron explained the importance of art in Jamaican culture and the influence many local artists have on the larger world. For centuries, Jamaican artists incorporated Eurocentric concerns and visual imagery that mimicked Western styles into their work, but since its independence, many artists have embraced a sense of identity rooted in the Caribbean experience. A new visual language is emerging, one which conveys the country’s political ambivalence, spiritual complexity and social order. This renaissance has brought clarity and a sense of self to the art community and beyond. The Wassi studio was small, but filled to the brim with colorful pottery — some pieces simplistic, others adorned with intricate tribal patterns. 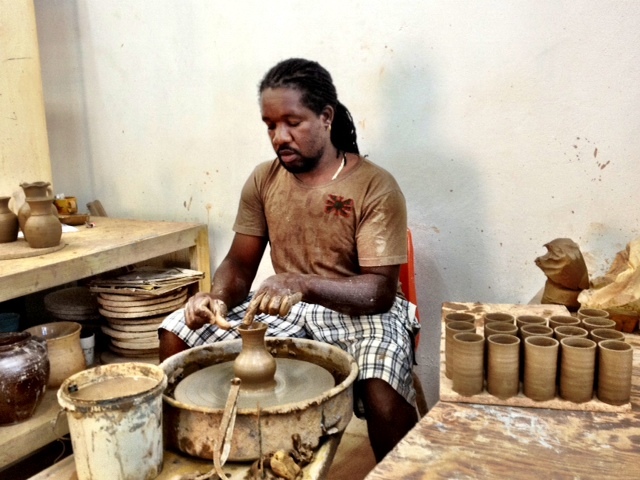 A local potter with thick dread locks and a soft smile was molding a vase at his station. He offered to give me a quick lesson using his apron, spin wheel and Jamaican terracotta clay. Obliged by the kind offer, I suited up and turned on the “Ghost” music station in my head. The potter guided my hands over a lump of clay and with several quick upward movements my soggy lump turned into a small, delicate bowl. I found the squishy sensation of the wet clay gliding through my fingertips to be fantastically calming and, well, fun. By the end of my lesson, I had the beginnings of a tiny plump vase that would be perfect for holding a decorative bouquet of lavender and thyme. After our tour of the galleries, we headed over to Scotchies, which was, in fact, mind-blowingly delicious. We vowed to go back on our way to the airport for a whole chicken and some sweet festivals (dough, similar in shape and length to a churro, consisting of cornmeal, flour, brown sugar and baking powder). During the last two days of our stay Aaron would pop by to check on us, which always ended up in a conversation about food or music. 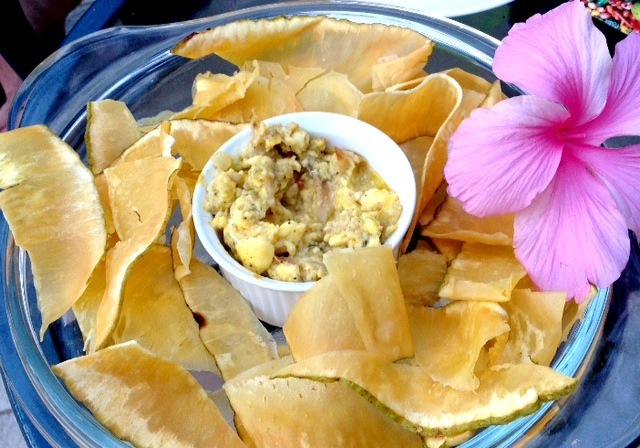 On one occasion, he surprised my husband and I with a plate of Ackee, saltfish and fried plantain chips specially prepared by the chef — a local dish I had been wanting to try. Scooping up every last bit while conversing about the night markets in Ocho Rios, I had forgotten about Aaron’s title and thought more of him as a friend who was happy to share some insight into his culture. He introduced us to other members of the Royal Plantation staff, who were equally as kind and genuine, and it was through these encounters and conversations that I did indeed learn a lot about Jamaican culture even though I was too ill to explore the nightlife, historic sites and natural landscapes. I realized not all guests view the butler service as a chance to befriend a local and learn about the country they are visiting. But I happen to think it’s our responsibility as travelers to appreciate a place by getting to know its people, honoring its traditions and respecting its resources. If we travel simply to indulge ourselves, leave our waste for someone else to clean, and to find American fixtures in a foreign environment, we are missing some of the greatest lessons life has to offer. I love Jamaican food and culture but have never had the chance for an up-close experience like this! What a wonderfully interesting sounding trip! And how lovely to have a local guide to the culture, like Aaron.